Grace anne is just a baby. Like our friend gregory last month, she doesn't know she is ugly. she just knows that no one stops to look at her. do you see her? she's 4 months old. She craves love. 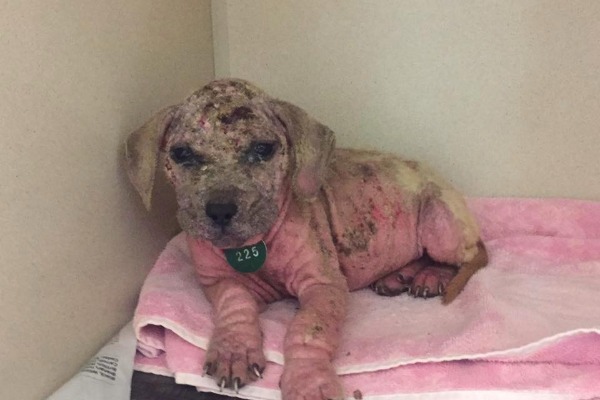 Easily treatable demodex mange. adoptable, or donate for rescue & offer to foster. i am a female, tan mastiff. the shelter staff thinks i am about 9-weeks-old. Shame on the person who called this four-month-old Grace Anne their puppy before she became sick and tossed her away like an old shoe. According to the shelter, the mastiff mix is so very itchy. Her skin has turned bright pink, she’s nearly bald and what’s left of her coat has turned yellow. Demodex is a common infestation of a puppy’s skin comprised of tiny, cigar shaped, eight legged mites that live and feed in the hair follicles and oil glands. Aside from the mange, Grace Anne also has a secondary skin infection that will have to be treated. This young gal’s time is nearing the close of life. Share her plight with approved rescue organizations, friends, family and social media contacts. Grace Anne’s options depend on all of us.